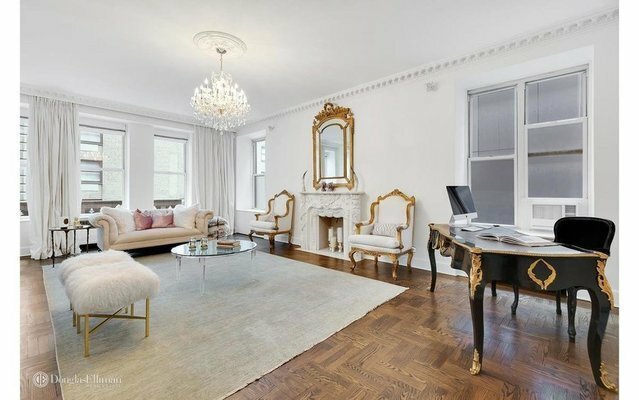 Regal scale and flawless renovation of this 2BR/2BTH is what this pre-war apartment is all about. Gourmet kitchen, soaring 10 ceilings, herringbone floors, and custom moldings, doors and hardware. Step into your comfortable foyer and ease into your formal dining room right off your large kitchen with stainless steel appliances, marble countertops and storage cabinets all the way to the tall ceiling. From there, for an after-dinner private relaxation or large scale entertaining, enter into your 27' long corner grand salon and take a seat by the wood-burning fireplace. Both generously sized bedrooms can be your master with one currently re-imagined as the ultimate personal dressing room. The master bath features impeccable design with a claw foot tub and inspiring elegance. Built in 1909 and crafted in the French Renaissance style, the iconic Alwyn Court includes full-time doorman, live-in super, personal storage rooms, bike room, laundry facility and a magnificent historic atrium. Pet friendly, W/D, Pied-a-terre and international buyers are welcome. Located right near Billionaires' Row, Carnegie Hall, Central Park, Columbus Circle, and the city's finest theatres, premier shops and restaurants.